Objective: Chronic obstructive pulmonary disease (COPD) is a major cause of morbidity and mortality, yet research suggests this disease is greatly underdiagnosed. This literature review sought to summarize the most common and significant variables associated with case-finding or missed cases of COPD to inform more effective and efficient detection of high-risk COPD patients in primary care. Methods: PubMed and EMBASE were searched for articles describing case-finding and epidemiologic research to detect or characterize new cases of COPD. International studies in primary and non-primary care settings, published in English from 2002–2014, were eligible for inclusion. Studies related to risk factors for development of COPD were excluded. Results: Of the 33 studies identified and reviewed, 21 were case-finding or screening and 12 were epidemiological, including cross-sectional, longitudinal, and retrospective designs. A range of variables were identified within and across studies. Variables common to both screening and epidemiological studies included age, smoking status, and respiratory symptoms. Seven significant predictors from epidemiologic studies did not appear in screening tools. No studies targeted discovery of higher risk patients such as those with reduced lung function or risks for exacerbations. Conclusion: Variables used to identify new cases of COPD or differentiate COPD cases and non-cases are wide-ranging, (from sociodemographic to self-reported health or health history variables), providing insight into important factors for case identification. Further research is underway to develop and test the best, smallest variable set that can be used as a screening tool to identify people with undiagnosed, high-risk COPD in primary care. Citation: Han MK, Steenrod AW, Bacci ED, et al for the High-Risk-COPD Screening Study Group. 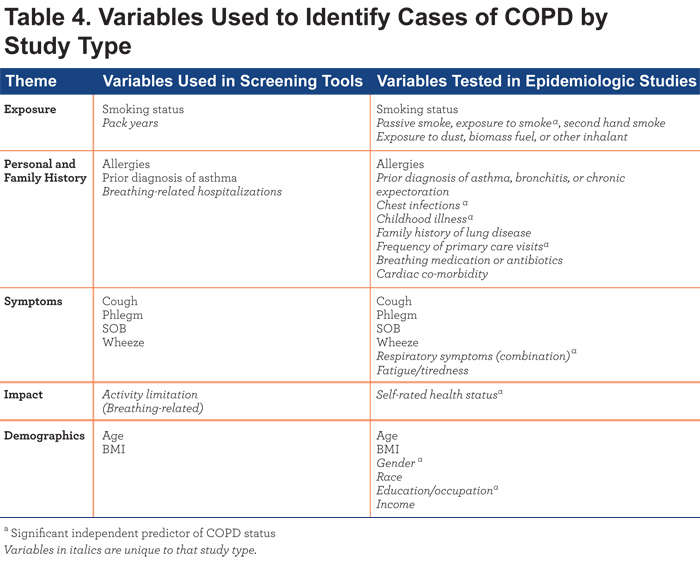 Identifying patients with undiagnosed COPD in primary care settings: Insight from screening tools and epidemiologic studies. Funding Support: Funding for this work was provided by the National Heart, Lung, and Blood Institute, NHLBI: R01 HL 114055. Project Officer: Antonello Punturieri, MD, PhD. Although spirometry is the diagnostic gold standard,1 it is not efficient as a case-finding tool, and routine use in primary care is not feasible or cost-effective. A brief, easy-to-use self-administered questionnaire may be a more practical method for identifying people most likely to have clinically significant COPD and who are in need of follow-up and diagnostic spirometric testing. Several screening questionnaires have been developed for use in varied settings, including the general population, primary care, and specialty areas, to identify people with COPD. None of these instruments (e.g., COPD Diagnostic Questionnaire [CDQ]14; COPD Assessment Test [CAT]15) have specifically attempted to identify previously undiagnosed individuals with clinically significant COPD or who are at high risk of an exacerbation. The current project is part of a larger study using a multi-method approach to develop a simple, standardized case-finding method for identifying individuals with moderate to severe airway obstruction and those at risk for AECOPD, who have not been diagnosed or treated for COPD. The approach includes a comprehensive literature review, systematic analyses of 3 datasets using random forests methodology, and qualitative research with individuals from the target population. The purpose of this literature review was to glean insight from existing screening or case-finding instruments and epidemiologic literature related to COPD case identification. Specifically, the intent was to compare and contrast the content and performance of screening questionnaires, as well as identify factors from the epidemiological literature that were predictive of those at high risk of AECOPD, in order to identify significant factors, or sets of factors, which would inform the selection of candidate constructs for the new case-finding tool. This search used PubMed and EMBASE databases to identify articles published in English, from January 1, 2002 to July 14, 2014. 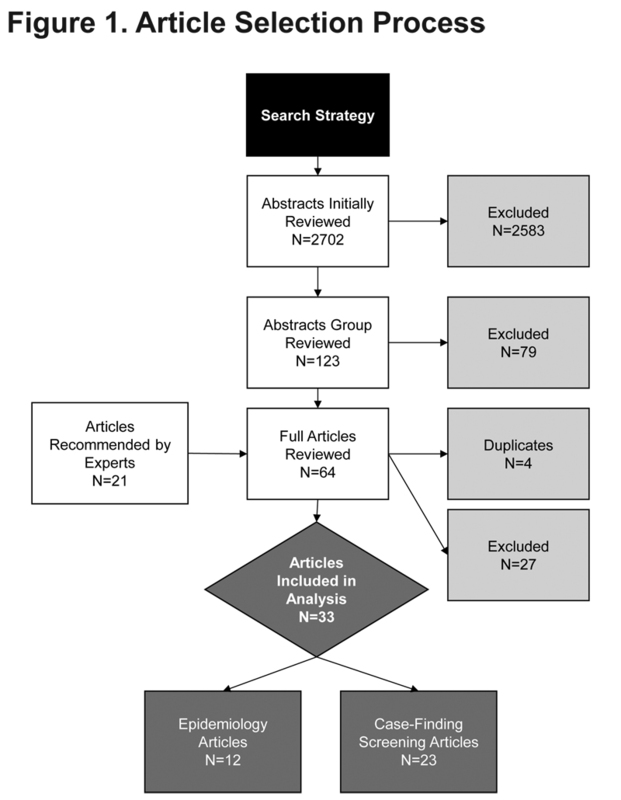 An overview of the search strategy is shown in Figure 1. The initial step was a broad search, to identify as many candidate articles as possible. Key search terms included: chronic obstructive pulmonary disease, chronic bronchitis, pulmonary emphysema, and related terms in combination with screening, case-finding, undiagnosed, early diagnosis, or questionnaire—specifying adults only. Search terms excluded papers related to depression, anxiety, nutrition, or diet, common but unrelated topics in the COPD and COPD epidemiology literature. Since the goal was to be more expansive than restrictive and review studies across available literature, articles were not restricted by study population (i.e., primary care, general population, etc.). Abstracts were reviewed by 2 research team members and selected for further review if the study addressed new case identification using screening or epidemiologic methods, and included empirical evidence of screening effectiveness (screening instrument studies) or predictive power (epidemiology studies). 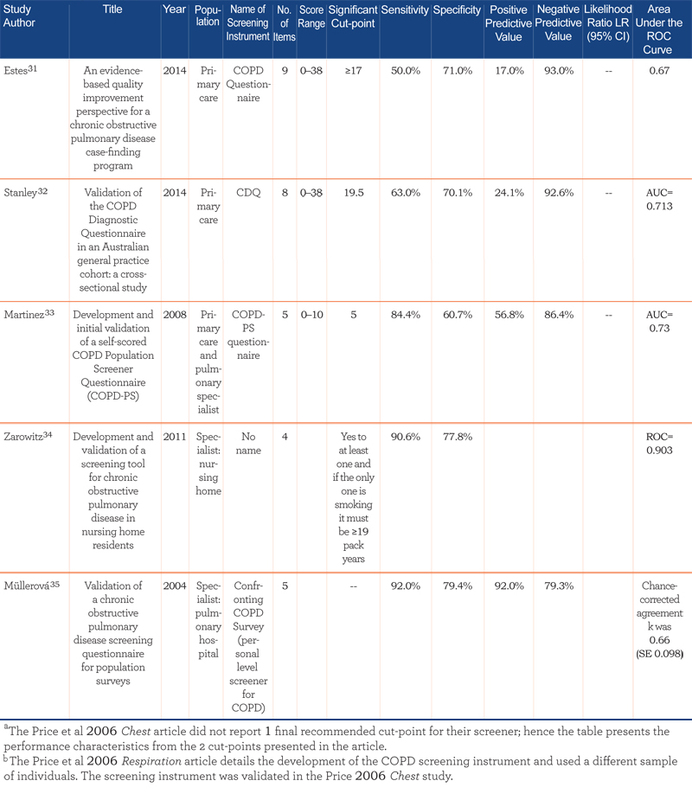 Abstracts of studies describing the prevalence of COPD; risk factors for the development of COPD; characteristic features or treatment outcomes of COPD, such as symptoms, quality of life, management strategies, smoking, or smoking cessation; studies using spirometric or genetic testing only; and case studies were excluded from further review. Abstracts of the selected papers were reviewed by the remaining team members who rated each on a 6-point Likert rating scale of relevance to the identification of candidate factors for identifying undiagnosed cases of COPD (0 = not very relevant to 5 = very relevant). Abstracts rated relevant or very relevant (mean score ≥4) were selected for full-text review. Team members were also asked to suggest additional articles that should be retrieved for further review. Two authors examined each of the full-text articles for consistency with the inclusion/exclusion criteria; articles failing to meet these criteria were excluded from further review. 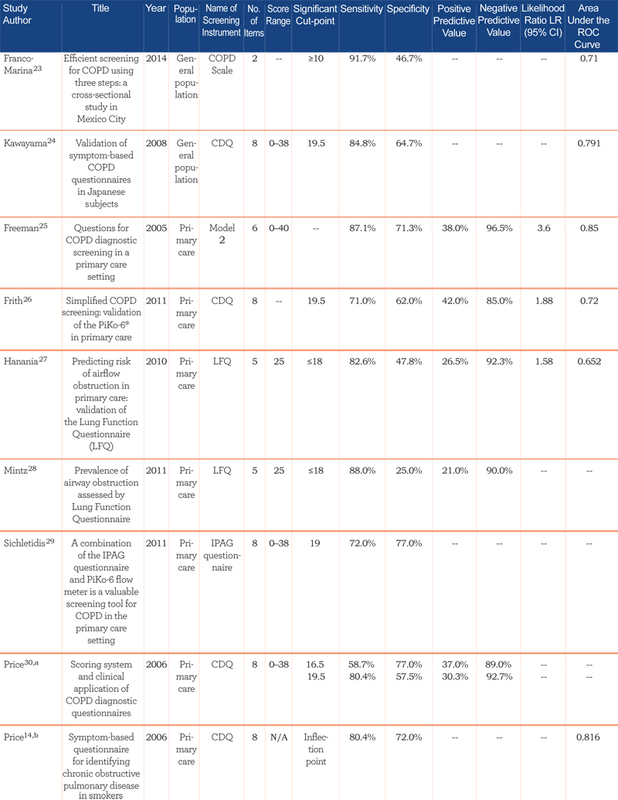 Data from the final set of articles were extracted and summarized in tables that included study design, sample size, study population, predictive factors, and results from the statistical analysis, including screening questionnaire performance or the value of predictive factors in identifying new cases of COPD. Figure 1 details the results from the article selection process. Of the 2702 abstract reviews and additional 21 papers identified, 64 articles were examined in detail and 33 met the inclusion/exclusion criteria for data extraction. The articles reviewed included 21 case-finding/screening and 12 epidemiologic studies. The case-finding/screening studies included development studies, validation studies, and retrospective data analysis reviews of developed screeners. The median sample size was 676 (range: 39–7701). Studies were conducted in a range of countries: United States (n=9), Australia (n=2), United Kingdom (n=2), Netherlands (n=1), Japan (n=1), Canada (n=1), China (n=1), Greece (n=1), Mexico (n=1), and United States and United Kingdom combined samples (n=2). The study populations consisted of primary care (n=9), the general population (n=9) (i.e., recruitment through random-digit dialing, conference attendance, and mailed surveys), specialist clinics (n=2), or a combination of both primary care and specialist clinics (n=1). Most studies (n=17) used the GOLD criteria for COPD case definition, where COPD was defined by a post bronchodilator FEV1/forced vital capacity (FVC) ratio less than 70%1; 2 studies used physician diagnosis via medical chart; and 1 study used pre-bronchodilator FEV1/FVC <70%. 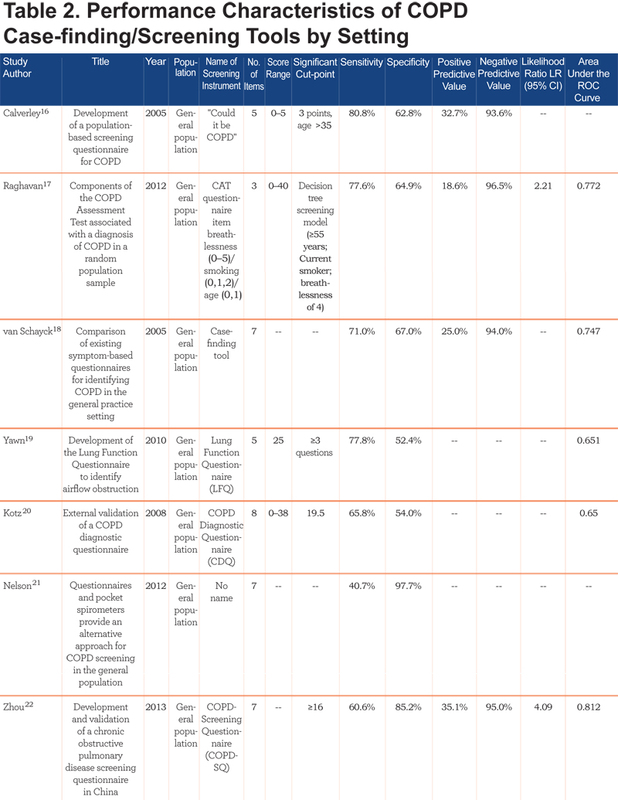 Table 1 summarizes key features of the 21 case-finding/screening questionnaires, grouped according to study population (i.e., general population, primary care, specialist, and combined). The number of questions present in each screener ranged from 223 to 1026 and included a range of factors. Most included age (n=20), smoking pack years (n=17), phlegm or sputum (n=16), cough (n=15), wheeze (n=13), and dyspnea or shortness of breath (SOB) (n=10). While these questions were more commonly found across screeners, questions inquiring about exposure (n=3) and family history (n=1) were also found, highlighting the range of questions that have been used to screen for COPD cases. 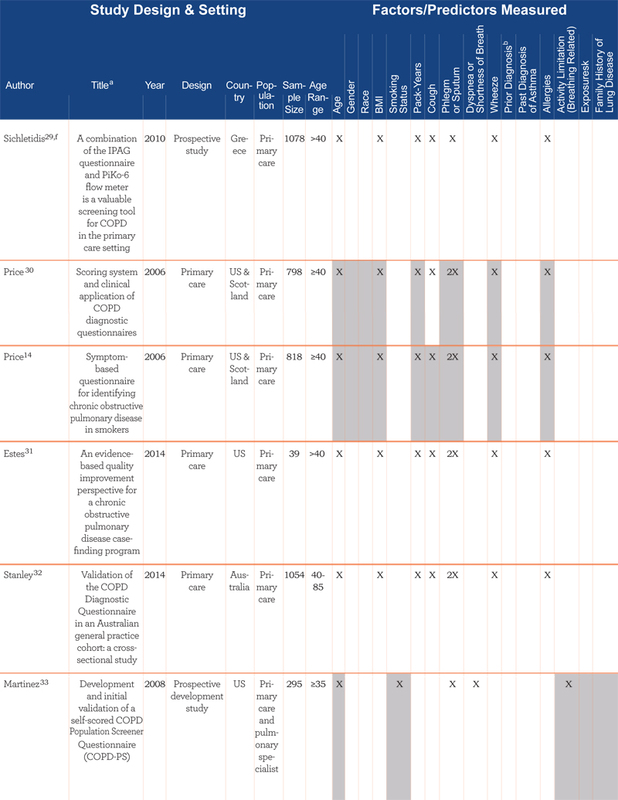 Performance characteristics of the screening instruments are summarized in Table 2. Overall, the epidemiological articles assessed 24 predictive factors. Of these, 17 were found to be statistically significant in at least 1 study and 6 were significant in more than half of the studies where assessed. Significant factors included: smoking history or status (n=8 of 10 studies), age (n=7 of 10 studies), cough (n=5 of 9 studies), wheeze (n=5 of 7 studies), dyspnea/SOB (n=4 of 9 studies), gender (n=4 of 9 studies), phlegm/sputum (n=4 of 6 studies), and body mass index (BMI) (n=3 of 5 studies). Similarities and differences in predictive factors identified in the screening and epidemiologic literature are summarized in Table 4. Although the themes/content categories were similar across study type, the range of factors was broader in the epidemiological literature. Almost half of predictive factors tested in the epidemiologic studies (11 of 24) did not appear in the screening questionnaires, such as sociodemographic factors (e.g., education or occupation) and personal history (e.g., primary care visits, chest infections, previous diagnosis of asthma). Seven factors unique to the epidemiologic literature were significant predictors of COPD diagnosis. These were chest infections (n=1 of 2 studies), childhood illness (n=1 of 2 studies), frequency of primary care visits (n=1 of 2 studies), respiratory symptoms (n=2 of 2 studies), self-rated health status (n=1 of 1 study), gender (n=4 of 9 studies, with male gender a significant predictor of COPD status), and education/occupation (n=1 of 4 studies). Interestingly, 1 study38 found exposure to organic dust and lower education were significant predictors of COPD in women who never smoked (n=1 of 1 study); passive smoke exposure was also of borderline significance in this group. Factors not included in the screeners and not statistically significant in the epidemiological studies were income, fatigue/tiredness, cardiac co-morbidity, and taking breathing medications or antibiotics. 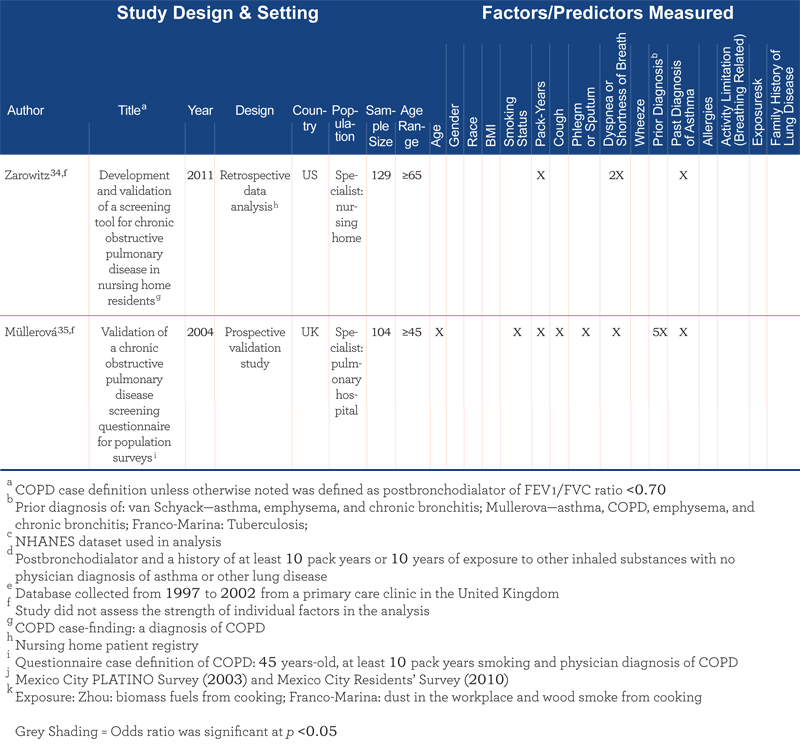 This paper summarizes predictive factors for identifying new cases of COPD (defined as the presence of airflow limitation on spirometry) using literature from case-finding/screening questionnaires and epidemiologic studies. The intent was to improve our understanding of the factors and sets of factors that can be used to identify people with undiagnosed COPD. This information is not only useful for general case-finding in clinical practice, but will be used together with data mining techniques and qualitative research methods to inform the development of candidate variables for a new method for identifying undiagnosed, clinically-significant COPD in primary care. 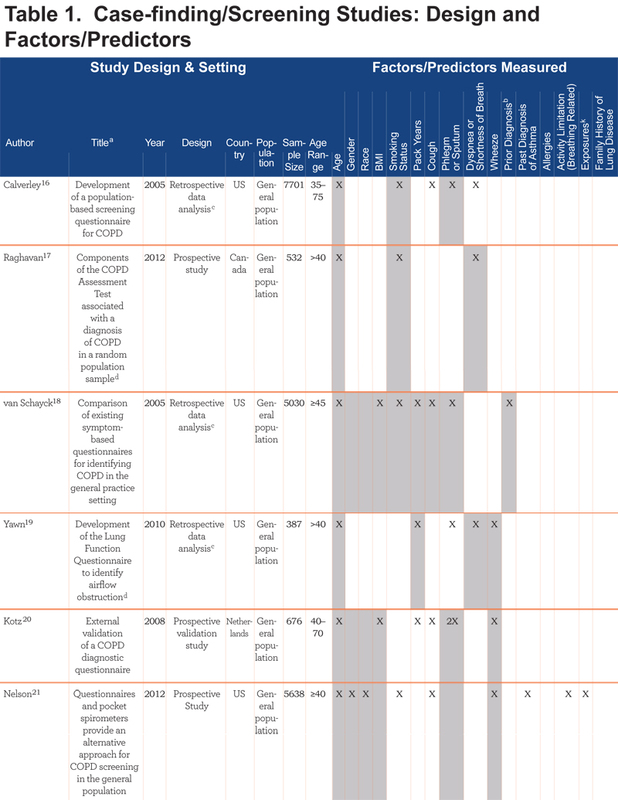 While the review summarized the COPD screening and epidemiologic studies separately, it is clear that, in many instances, COPD screening tools were built based upon the existing epidemiologic literature. For example, Calverley et al16 first identified characteristics of COPD patients by conducting a literature review, and then identified the correspondence to those specific questions in the NHANES III dataset. Similarly, van Schayk et al18 conducted a literature review to first identify previously available tools and potentially useful items for screening, and then retrospectively validated the selected set of items using the NHANES III dataset. Yawn et al19 used NHANES III data for empirical item selection and item-reduction, and conducted a qualitative assessment phase to assess the content and face validity of their items via physician focus groups and patient interviews. Martinez et al33 used a combination of expert opinion and patient survey data. Not surprisingly, there was substantial overlap between the screening and epidemiologic studies amongst individual factors most likely to identify COPD. In both studies, factors that appear to be strongly associated with COPD were older age, BMI, smoking history, and symptoms such as cough, wheeze, and dyspnea. However, we also identified factors through the epidemiological studies that were not included in the screening studies. One of these factors was childhood illness. Other lines of research suggest that factors such as prenatal maternal smoking, low birth weight, postnatal tobacco exposure, and childhood respiratory infections may predispose individuals to the development of COPD.48 Therefore, it makes sense that factors like childhood illness might increase the likelihood of identifying individuals with COPD. History of chest infections, frequency of primary care visits, and poor self-rated health status were also factors identified in the epidemiologic studies but not tested in the screening studies. While it is possible that chest infections could predispose the development of COPD, it is also possible that chest infections, frequent primary care utilization, and poorer health status are manifestations of COPD, which could aid in the identification of high-risk COPD. With respect to performance characteristics, it should be noted that the screening tools were tested in a variety of populations, which significantly influenced the sensitivity and specificity of the instruments. Several authors commented on how a study population can influence the performance properties of a screening tool. For example, the CDQ screening tool developed by Price et al30 had good performance properties in the initial evaluation (AUC=0.82). However, in 2 subsequent articles where other authors tested the same screening tool in different samples, the performance characteristics of the screening tool were reduced (AUC=0.65 in Kotz et al20; AUC=0.72 in Frith et al26). Frith et al26 suggested that the difference in results may be due to differences in the demographic characteristics of the study populations (the individuals in the original study by Price et al30 were younger with lower cumulative cigarette consumption compared to Frith et al26). Frith concluded that the utility of screening questionnaires may be more limited outside the development and validation population. Alternatively, Yawn et al19 developed a screening tool to be useful across a broad spectrum of patient types and settings, rather than targeted to a particular population (e.g., smokers), as many of the other studies were.20,25,26,28-30 Yawn et al19 tested their items in both a general population and a chronic bronchitic population and found that items performed similarly. This highlights the importance of considering the target population during questionnaire development and initial validation. Several limitations of this review should be mentioned. First, due to the heterogeneity among studies in terms of study design, the large number of different risk factors studied, and the different ways in which certain variables were measured (e.g., smoking), the use of meta-analytic techniques was not the appropriate methodology to synthesize results. This may be possible in the future, as more studies utilize the same screening tool or capture the same risk factors in the same way. Second, the review was limited to studies published in English, and the majority of the studies were from developed countries, limiting generalizability of results to patients in other countries. In developing countries, risk factors such as biomass fuel exposure and occupational exposures are likely important and would need to be considered when developing a case-finding questionnaire specific to these countries. Finally, most studies use FEV1/FVC <0.70 as the cutoff for COPD diagnosis, which is likely to overdiagnose disease in older individuals. Previous research suggests that COPD is widely under-diagnosed,9 with many individuals experiencing symptoms of clinically-significant COPD or AECOPD, with diagnosis at the time of the event. Case-finding methods are needed to easily and accurately identify these patients as part of routine clinical practice. Screening tools are available which cover several key factors, e.g., the COPD Population Screener Questionnaire (COPD-PS)33 and the Lung Function Questionnaire (LFQ),19 but our literature review highlights new variables such as prenatal maternal smoking, low birth weight, postnatal tobacco exposure, and childhood respiratory infection that could further the precision of screening in primary care settings. Factors were identified in the epidemiologic studies that have not been tested in screening studies, including prior history of chest infections, childhood illness, self-rated health status, and frequency of primary care visits. Incorporating these missing variables into a COPD case-finding measure may allow clinicians to accurately identify not only undiagnosed cases of COPD, but also patients at risk of clinically-significant COPD that would benefit most from treatment. Currently, no method has been developed to identify this group in most need of care. The findings from the present study are currently being used in further work to find the smallest set or combination of items that are able to identify undiagnosed, high-risk COPD patients in primary care. The use of values from a peak flow meter, such as that used by Nelson et al21 and Sichletidis et al,29 combined with the questionaniare may further refine the patient population in whom spirometry is needed. This review lays the groundwork for a multi-method development of a new screening approach for identifying undiagnosed, clinically-significant COPD in a primary care setting. Findings from this review highlight several factors that previous research has shown to be consistently and significantly associated with COPD case-finding in a variety of health care settings: age, BMI, wheeze, phlegm/sputum, smoking, cough, and dyspnea/breathlessness. However, our review suggests there are other factors—such as childhood illness and education/occupation—that are not included in existing screening questionnaires, but may also increase our ability to more precisely identify undiagnosed cases of clinically-significant COPD. The authors thank Sarah Clifford and Lindsey Murray for their comments during the early stages of this work and Kathryn Miller for text editing and formatting. Dr. Han has consulted for GlaxoSmithKline, Boehringer-Ingelheim, and Regeneron. She has served on speaker bureaus for GlaxoSmithKline, Novartis, Boehringer-Ingelheim, Forest, and Grifols. Dr. Leidy, Dr. Bacci, Ms. Kim, Ms. Steenrod, and Ms. Murray are employees of Evidera, a health care research firm that provides consulting and other research services to pharmaceutical, device, government, and non-government organizations. In this salaried position, they work with a variety of companies and organizations and receive no payment or honoraria directly from these organizations for services rendered. Dr. Mannino has received honoraria/consulting fees and served on speaker bureaus for GlaxoSmithKline PLC, Novartis Pharmaceuticals, Pfizer Inc., Boehringer-Ingelheim, AstraZeneca PLC, Forest Laboratories Inc., Merck, Amgen, and Creative Educational Concepts. Furthermore, he has received royalties from UptoDate and is on the Board of Directors of the COPD Foundation. Dr. Thomashow has consulted for Boehringer-Ingelheim and has been on advisory boards for GlaxoSmithKline PLC, Novartis, AstraZeneca PLC, and Forest. Dr. Barr received grant funding for this work from the National Heart Lung and Blood Institute under R01HL114055. Dr. Barr received grant support from the National Institutes of Health (NIH), the United States Environmental Protection Agency, and the Alpha-1 Foundation; he has received royalties from UpToDate. Dr. Make has participated in research studies and/or served on medical advisory boards for AstraZeneca, Boehringer-Ingelheim, CSL Bering, GlaxoSmithKline, Forest, Novartis, Spiration, and Sunovion. Dr. Bowler's work has been funded by the NIH, FAMRI, Butcher Foundation, and John W. Carson Foundation. He participates in AstraZeneca and GlaxoSmithKline- sponsored clinical trials. He has received compensation as a member of scientific advisory boards of Boehringer Ingelheim Pharmaceutical. Dr. Rennard has had or currently has a number of relationships with companies who provide products and/or services relevant to outpatient management of chronic obstructive pulmonary disease, including the American Association of Respiratory Care, the American Board of Internal Medicine, Able Associates, Align2 Acton, Almirall, APT, AstraZeneca, the American Thoracic Society, Beilenson, Boehringer Ingelheim, Chiesi, CIPLA, Clarus Acuity, CME Incite, the COPD Foundation, Cory Paeth, CSA, CSL Behring, CTS Carmel, Dailchi Sankyo, Decision Resources, Dunn Group, Easton Associates, Elevation Pharma, FirstWord, Forest, GLG Research, Gilead, Globe Life Sciences, GlaxoSmithKline, Guidepoint, Health Advance, HealthStar, HSC Medical Education, Johnson and Johnson, Leerink Swan, LEK, McKinsey, Medical Knowledge, Medimmune, Merck, Navigant, Novartis, Nycomed, Osterman, Pearl, PeerVoice, Penn Technology, Pennside, Pfizer, Prescott, Pro Ed Communications, PriMed, Pulmatrix, Quadrant, Regeneron, Saatchi and Saatchi, Sankyo, Schering, Schlesinger Associates, Shaw Science, Strategic North, Summer Street Research, Synapse, Takeda, Telecon SC, ThinkEquity; these relationships include serving as a consultant, advising regarding clinical trials, speaking at continuing medical education programs and performing funded research both at basic and clinical levels. Dr. Rennard does not own any stock in any pharmaceutical companies. Dr. Houfek declares no conflict of interest. Dr. Yawn has received research funding from the NIH, AHRQ, the Centers for Disease Control and Prevention, and from Boehringer Ingelheim for research on COPD. Dr. Yawn has received compensation from Merck and Forrest for COPD advisory boards on COPD, and Grifols for advisory board on alpha-1 antitrypsin deficiency states. Catherine Meldrum declares no conflict of interest. John W. Walsh declares no conflict of interest. Dr. Martinez has participated in steering committees on COPD or idiopathic pulmonary fibrosis sponsored by Bayer, Centocor, Forest, Gilead, Janssens, GlaxoSmithKline, Nycomed/Takeda and Promedior. He has participated in advisory boards for COPD or IPF for Actelion, Amgen, Astra Zeneca, Boehringer Ingelheim, Carden Jennings, CSA Medixcal, Ikaria, Forest, Genentech, GlaxoSmithKline, Janssens, Merck, Pearl, Nycomed/Takeda, Pfizer, Roche, Sudler & Hennessey, Veracyte, and Vertex. He has prepared or presented continuing medical presentations on COPD or IPF for the American College of Chest Physicians, the American Thoracic Society, CME Incite, the Center for Health Care Education, Inova Health Systems, MedScape, Miller Medical, the National Association for Continuing Education, Paradigm, Peer Voice, Projects in Knowledge, Spectrum Health System, St. John’s Hospital, St. Mary’s Hospital, the University of Illinois Chicago, the University of Texas Southwestern, the University of Virginia, UpToDate, and Wayne State University. Dr. Martinez has participated in data safety monitoring committees sponsored by GlaxoSmithKline and Stromedix. He has assisted with U.S. Food and Drug Administration presentations sponsored by Boehringer Ingelheim, GlaxoSmithKline, and Ikaria. He has spoken on COPD for Bayer, Forest, GlaxoSmithKline, and Nycomed/Takeda. He has participated in advisory teleconferences sponsored by the American Institute for Research, Axon, Grey Healthcare, Johnson & Johnson, and Merion. He has received book royalties from Informa. 1. Calverley PM, Nordyke RJ, Halbert RJ, Isonaka S, Nonikov D. Development of a population-based screening questionnaire for COPD. COPD. 2005;2(2):225-232. 2. Raghavan N, Lam YM, Webb KA, et al. Components of the COPD Assessment Test (CAT) associated with a diagnosis of COPD in a random population sample. COPD. 2012;9(2):175-183. 3. van Schayck CP, Halbert RJ, Nordyke RJ, et al. Comparison of existing symptom-based questionnaires for identifying COPD in the general practice setting. Respirology. 2005;10(3):323-333. 4. Yawn BP, Mapel DW, Mannino DM, et al. Development of the Lung Function Questionnaire (LFQ) to identify airflow obstruction. Int J Chron Obstruct Pulmon Dis. 2010;5:1-10. 5. Kotz D, Nelemans P, van Schayck CP, Wesseling GJ. External validation of a COPD diagnostic questionnaire. Eur Respir J. 2008;31(2):298-303. 6. Zhou YM, Chen SY, Tian J, et al. Development and validation of a chronic obstructive pulmonary disease screening questionnaire in China. Int J Tuberc Lung Dis. 2013;17(12):1645-1651. 7. Franco-Marina F, Fernandez-Plata R, Torre-Bouscoulet L, et al. Efficient screening for COPD using three steps: a cross-sectional study in Mexico City. NPJ Prim Care Respir Med. 2014;24:14002. 8. Kawayama T, Minakata Y, Matsunaga K, et al. 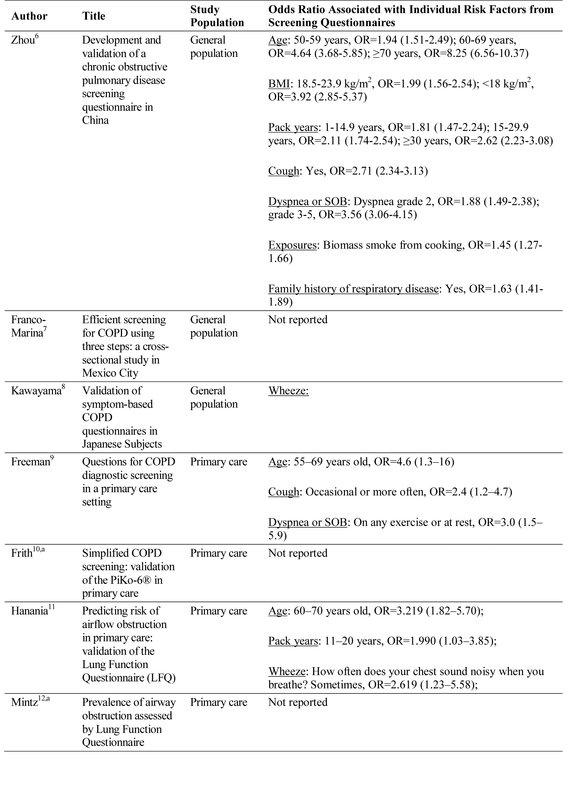 Validation of symptom-based COPD questionnaires in Japanese subjects. Respirology. 2008;13(3):420-426. 9. Freeman D, Nordyke RJ, Isonaka S, et al. 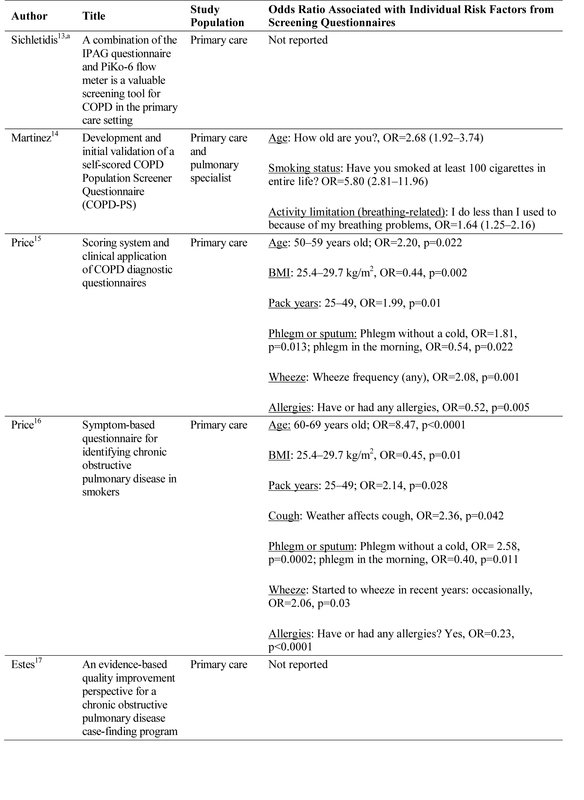 Questions for COPD diagnostic screening in a primary care setting. Respir Med. 2005;99(10):1311-1318. 10. Frith P, Crockett A, Beilby J, et al. 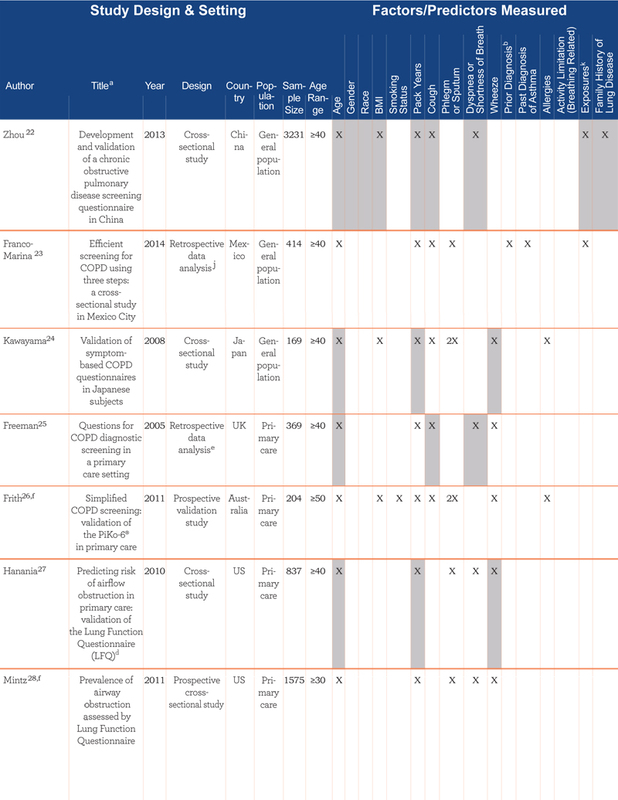 Simplified COPD screening: validation of the PiKo-6(R) in primary care. Prim Care Respir J. 2011;20(2):190-198, 192 p following 198. 11. Hanania NA, Mannino DM, Yawn BP, et al. Predicting risk of airflow obstruction in primary care: Validation of the lung function questionnaire (LFQ). Respir Med. 2010;104(8):1160-1170. 12. Mintz ML, Yawn BP, Mannino DM, et al. Prevalence of airway obstruction assessed by lung function questionnaire. Mayo Clin Proc.2011;86(5):375-381. 13. Sichletidis L, Spyratos D, Papaioannou M, et al. A combination of the IPAG questionnaire and PiKo-6(R) flow meter is a valuable screening tool for COPD in the primary care setting. Prim Care Respir J. 2011;20(2):184-189, 181 p following 189. 14. Martinez FJ, Raczek AE, Seifer FD, et al. Development and initial validation of a self-scored COPD Population Screener Questionnaire (COPD-PS). COPD. 2008;5(2):85-95. 15. Price DB, Tinkelman DG, Nordyke RJ, et al. 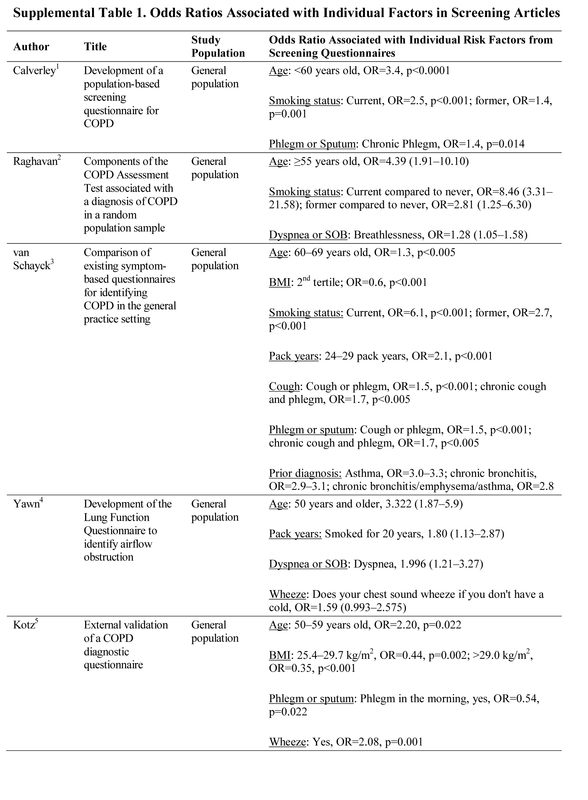 Scoring system and clinical application of COPD diagnostic questionnaires. Chest. 2006;129(6):1531-1539. 16. Price DB, Tinkelman DG, Halbert RJ, et al. Symptom-based questionnaire for identifying COPD in smokers. Respiration. 2006;73(3):285-295. 17. Estes TS, Short N, Bowser D, Boyle A. An evidence-based quality improvement perspective for a chronic obstructive pulmonary disease case-finding program. Chron Respir Dis. 2014;11(3):131-138. 18. Stanley AJ, Hasan I, Crockett AJ, van Schayck OC, Zwar NA. Validation of the COPD Diagnostic Questionnaire in an Australian general practice cohort: a cross-sectional study. Prim Care Respir J. 2014;23(1):92-97. 19. Zarowitz BJ, O'Shea T, Lefkovitz A, Peterson EL. Development and validation of a screening tool for chronic obstructive pulmonary disease in nursing home residents. J Am Med Dir Assoc. Nov 2011;12(9):668-674. 20. 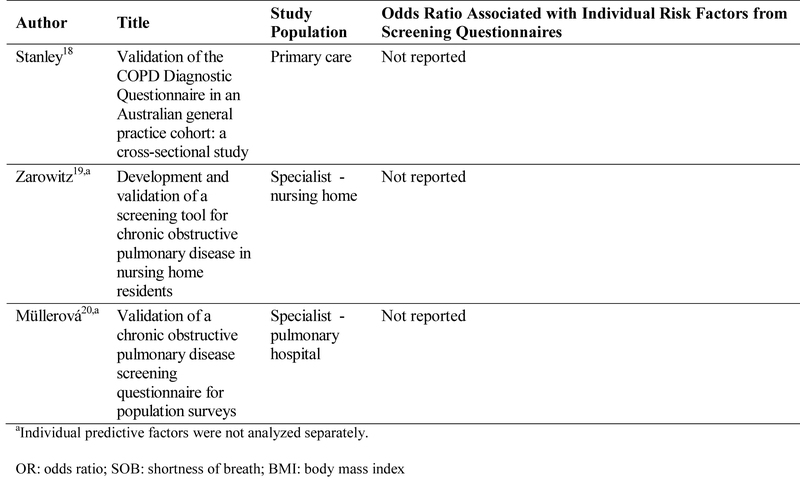 Mullerova H, Wedzicha J, Soriano JB, Vestbo J. Validation of a chronic obstructive pulmonary disease screening questionnaire for population surveys. Respir Med. 2004;98(1):78-83. 1. Global Initiative for Chronic Obstructive Lung Disease (GOLD). 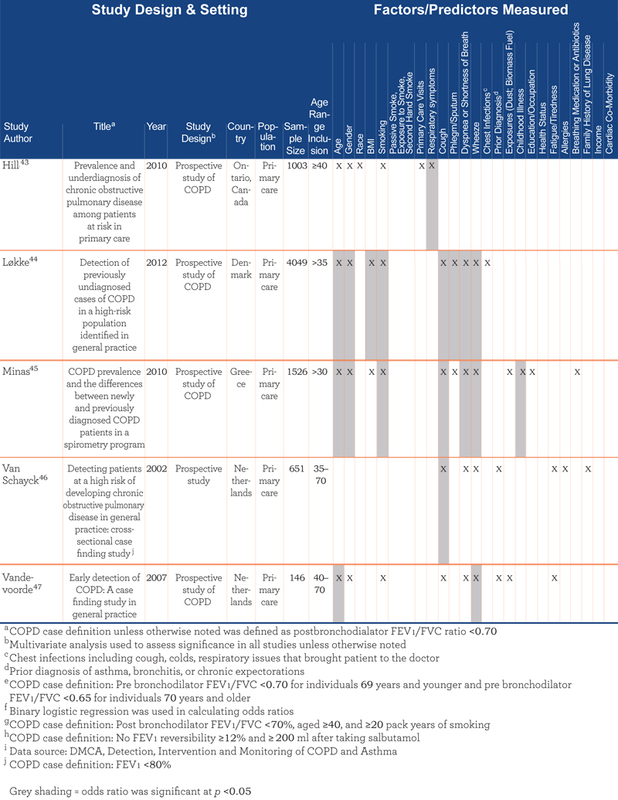 Global Strategy for the Diagnosis, Management, and Prevention of COPD. GOLD website. http://www.goldcopd.org/uploads/users/files/GOLD_Report_2013Feb13.pdf. Accessed November 2014. 5. Centers for Disease Control and Prevention. Deaths from chronic obstructive pulmonary disease – United States 2000–2005. Morb Mortal Wkly Rep. 2008;57(45):1229-1232. 6. Kochanek KD, Xu J, Murphy SL, Minino AM, Kung HC. Deaths: final data for 2009. Natl Vital Stat Rep. 2011;60(3):1-117. 7. Centers for Disease Control and Prevention. Chronic obstructive pulmonary disease among adults – United States 2011. Morb Mortal Wkly Rep. 2012;61(46):938-943. 11. Martinez FJ. 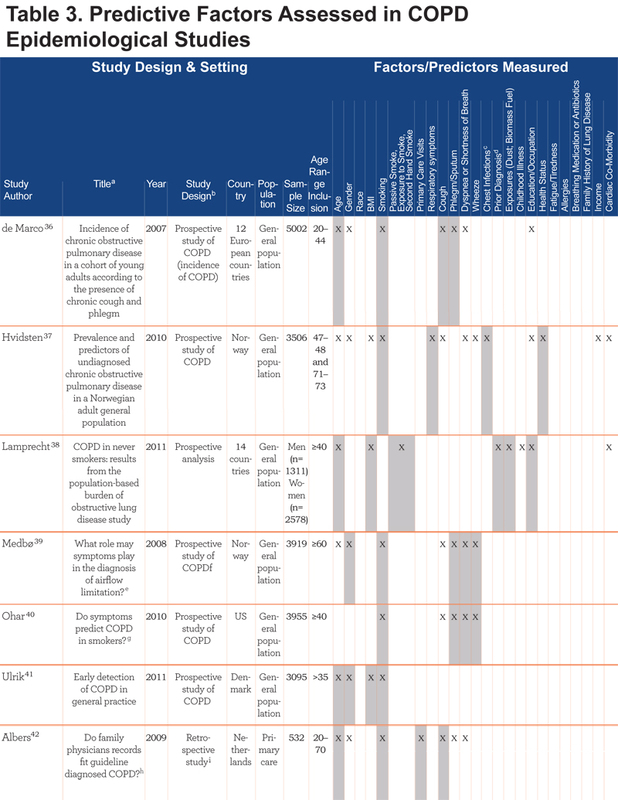 A Case-finding strategy for moderate-to-severe COPD in the United States. Paper presented at: National Heart Lung and Blood Institute Workshop, 2009. 19. Yawn BP, Mapel DW, Mannino DM, et al. Development of the Lung Function Questionnaire (LFQ) to identify airflow obstruction. Int J Chron Obstruct Pulmon Dis. 2010;5:1-10.